Global Connectedness, along with Local Connectedness and Global Market Reach, constitutes the new genome of scaleups and high-performance ecosystems. Funding and Talent are very important, but not enough. Ever wonder why Stockholm, a relatively small startup ecosystem, produces scaleup firms at such a high rate? Why does Chicago, an ecosystem three times bigger, not produce more of them? Answer: Despite its size, Stockholm’s startup founders are very well connected to their peers in the world’s top 7 ecosystems. Those connections, what we call Global Connectedness, keep them at the leading edge of global knowledge about innovation and business models. 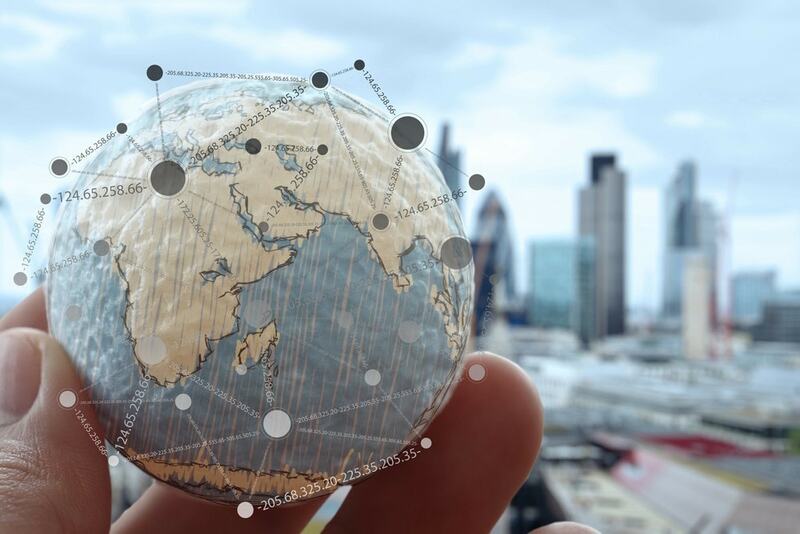 This gives startups an ability to engage with global customers from their earliest stages: global connections allow founders, and the entire ecosystem, to tap into a global fabric of ideas, talent, capital, and know-how. Access to this fabric helps startups become scaleups, driving regional economic growth and job creation. In Stockholm, extensive connections to this global fabric have led to a higher likelihood that startups there are developing products with global customers in mind. Horizons are lower in Chicago due to a lack of Global Connectedness: fewer startups in Chicago say (in our survey) that they are developing products for global markets. Global Connectedness injects the global knowledge crucial to the creation of globally-leading startups, which is a key ingredient of Global Market Reach. 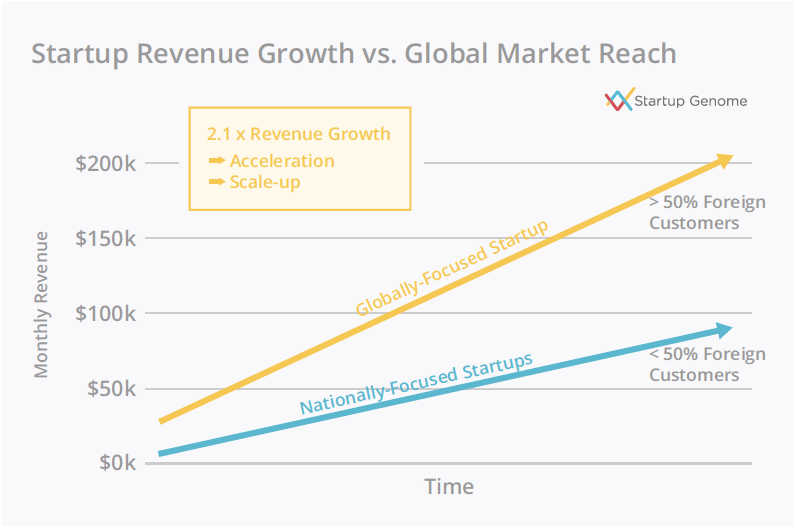 As prior Startup Genome research established, startups that focus on and penetrate global markets from their earliest stage are able to grow revenues twice as fast (see Figure). Networks and connections have long been assumed to be important in determining the strength of startup ecosystems. Attempts to quantify this have been good but limited by data availability. Through our primary research with thousands of startup founders and executives around the world, our research has consistently found that globally-connected startup ecosystems grow faster and perform better than less-connected places. Knowledge about innovations or the complexities of disruptive business models are spread by word of mouth between people with quality relationships, not through LinkedIn connections. We define quality relationships as those in which someone can text, email, or call and receive not only a response but a conversation or an introduction or a reference. Having a person’s business card is one thing; being able to text them and exchange substantive ideas over coffee is altogether different. Despite the global availability of patent filings, for example, most patent citations occur within the same geographic area of the patent holder. Relationships matter. These relationships weave together to create the global fabric of knowledge, ideas, people, and organizations. Being part of this global fabric may increase access to potential customers elsewhere, and that certainly helps startup performance. However, the global fabric also imports know-how and experience and ambition into an ecosystem. Startups in your community may have an idea that is relevant to problems at the global frontier, but they won’t know unless they’re connected. At the same time, perhaps their ideas have been tried before somewhere else in the world. Being globally connected will help them realize that before they get too far down the road. Productivity and innovation increases as startups go global — in any given economy, companies with more exposure to foreign markets are the “frontier” firms that drive growth. A focus on foreign customers also means faster growth for entire ecosystems. When we look at where startups report having the highest shares of customers elsewhere, we see a mix of top-performing ecosystems and smaller places. The significant relationship is not with size but Global Connectedness. What the chart also demonstrates is that in many of these ecosystems global selling is related to the small size of their national economies or their geographic locations. The domestic markets in Israel and New Zealand are small, so startups almost by definition must go global. In Europe, in addition to Stockholm, startups in Helsinki also boast high Global Market Reach. This is not, however, purely a reflection of domestic market size. We measure the extent to which startups sell to customers not only outside their home country but also outside the immediate continental region. The chart captures the latter. Sure, Helsinki startups can sell into the single European market, thus “going global” at a higher rate than those in Chicago. When we remove Europe from Helsinki’s calculation, startups there still sell to global markets at a high rate. This is not true elsewhere. In many Canadian cities, startups report high percentages of foreign customers — viz., anywhere outside Canada. When the United States is removed from the calculation, Global Market Reach in nearly every Canadian ecosystems falls close to single digits. Canadian startups are not reaching markets in Europe or Asia to a large degree. While there is a hierarchy of Global Connectedness within each region of the world, Silicon Valley, London, and New York form the Global Connectedness core. connections to Silicon Valley. When we include U.S. startups, that figure rises to 47 percent. This means that even small companies located in Silicon Valley are global customers because they become knowledgeable of what the latest and greatest technologies are by drawing on global startups competing locally. Also, it means that more easily than anywhere else, Silicon Valley founders, investors, and advisors can also become knowledgeable of the latest global customer needs and the latest innovations pretty much anywhere in the world. Analyzing these hubs can tell us which ecosystems have the strongest gravitational pull for startup ideas and resources and, thus, where startups are best positioned to go global regarding market reach. 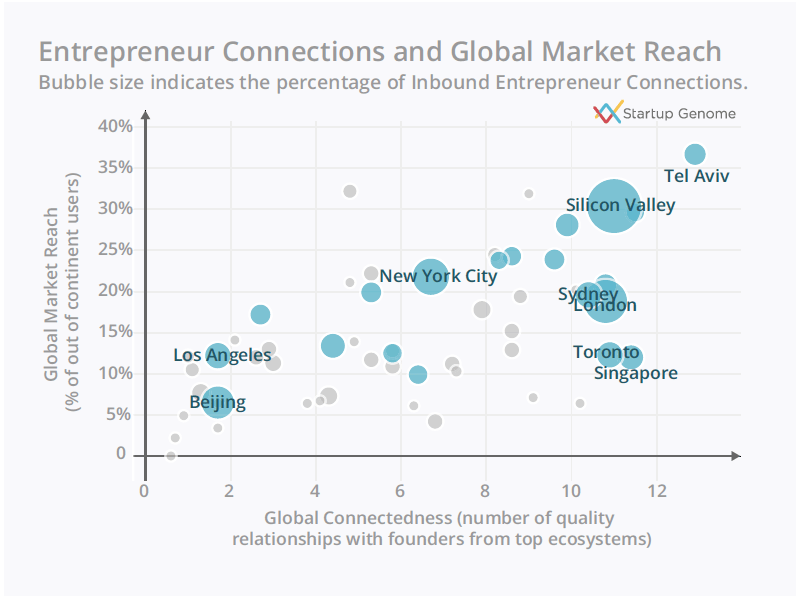 Silicon Valley dominates the connections of nearly every single other startup ecosystem — some sort of connection with a startup founder or executive in Silicon Valley, it seems, is almost a prerequisite for startups elsewhere. In each region of the world, the most connected ecosystems are those with the most connections to Silicon Valley. The exception, of course, is North America, where Silicon Valley is the dominant startup ecosystem — it has the most connections to New York City, followed by London and Tel Aviv. brings in more ideas and more innovation, resulting in faster startup growth and more vibrant ecosystems. Startups thrive on relationships and the exchange of ideas — with customers, investors, corporations, and, especially, other startups. These ideas include “hard” knowledge such as technical ideas about product improvement, new scientific ideas, and how to sell into different markets. However, Global Connectedness also brings the benefits of a global network to startups and their ecosystems. The exchange of this knowledge occurs through personal relationships: the broader those relationships are, the better the growth outcomes will be for startups and their ecosystems.